A new photo has been leaked which shows Samsung’s two new flagship handsets, the Samsung Galaxy S6 and the Galaxy Edge. The photo of the two devices what obtain by CNET Korea, and this is the first time we have seen a photo featuring the new Samsung Galaxy Edge. As we can see from the photo, the Samsung Galaxy Edge has a curved display where the screen wraps around the edges of the handset, the design looks very similar to the Galaxy Note Edge. The two handsets are expected to come with similar specifications, which will include a 5.1 inch display with a QHD resolution of 2560 x 1440 pixels. Processing on both devices is expected to come from a new eight core 64-bit processor, the Samsung Exynos 7420 and the handsets are said to come with 3GB of RAM. Samsung are rumored to offer three storage options, 32GB, 64GB and 128GB and both models may feature the same cameras. 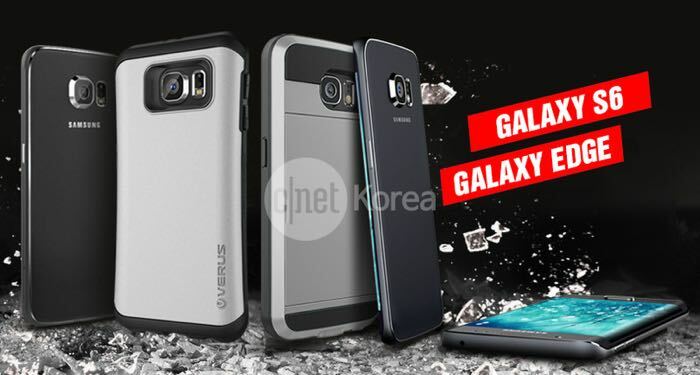 The Samsung Galaxy S6 is said to feature a 20 megapixel camera on the back and a 5 megapixel camera up front, the Galaxy Edge could feature the same rear camera, although there have been rumors of a 16 megapixel camera for this handset. Samsung will be unveiling these two new handsets at Mobile World Congress next month, the company is holding their Samsung Unpacked event on Sunday the 1st of March.